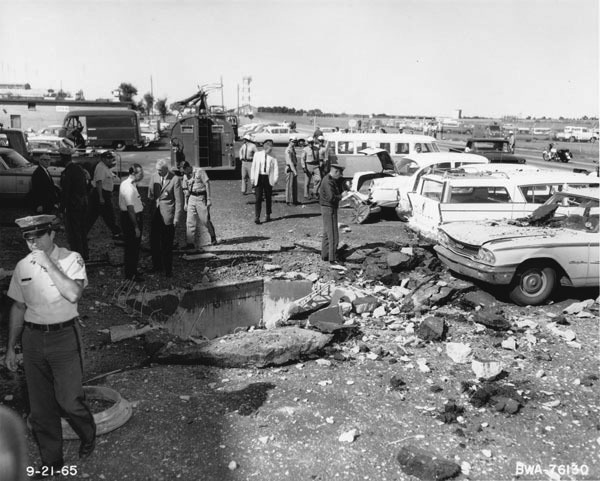 Description: Law enforcement officers and investigators look over damage caused by natural gas explosion at Boeing Plant II. Blast was in electrical cable manhole in parking lot between Oliver Street and plant. One picket for striking members of International Association of Machinists received abrasions from flying debris. Photograph taken September 21, 1965. Keywords: Wichita, aviation, business and industry, public services, government, people. Description: Aerial view of Lear Jet plant in southwest Wichita near airport. View is looking northeast toward Wichita. Kellogg Street in top portion of image. Keywords: Wichita, aviation, aerials, business and industry. 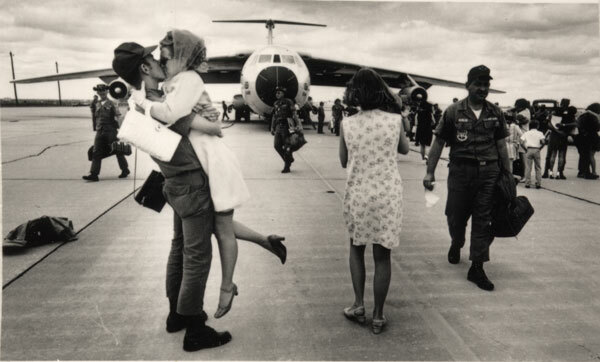 Description: Members of the 184th Tactical Fighter Group, U.S. Air Force, return to Wichita after an eleven-month tour of duty in Korea. Location, McConnell Air Force Base. Keywords: Wichita, aviation, government, military, public events, people, transportation, airplanes, servicemen, welcome, home, United States. 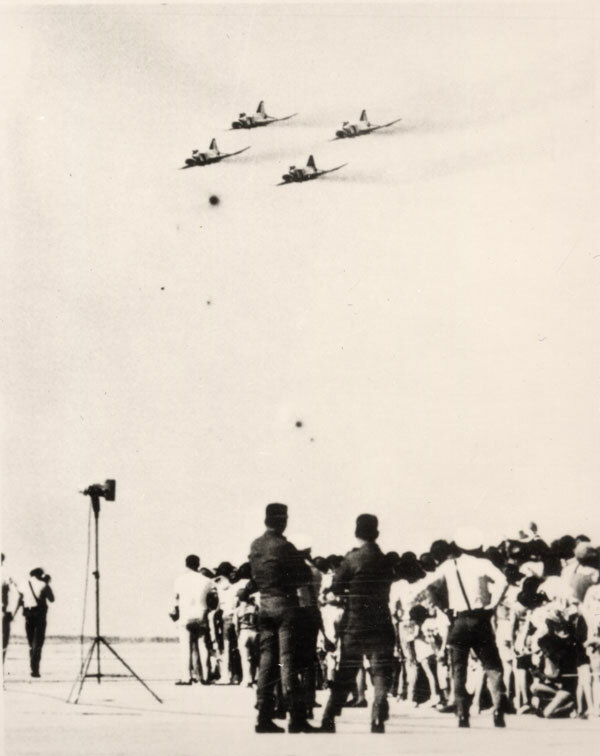 Description: Crowd watching an airshow featuring the Air Force Thunderbirds demonstration team. The F-4 Phantom planes are flying in military formation over McConnell Air Force Base in Wichita. Keywords: Wichita, aviation, government, military, people, public events, transportation, airplanes. Description: View of control tower and Wichita Mid-Continent Airport sign above main entrance to terminal building. Built as Wichita Municipal Airport in 1954, the facility located on the southwest side of Wichita was renamed Wichita Mid-Continent Airport in 1973. Keywords: Wichita, buildings, aviation, business and industry. Description: Boeing 727 passenger jet N2811W operated by Western Air Lines shown with crew members at Wichita Mid-Continent Airport. View is looking northeast toward control tower. Keywords: Wichita, aviation, business and industry, buildings. 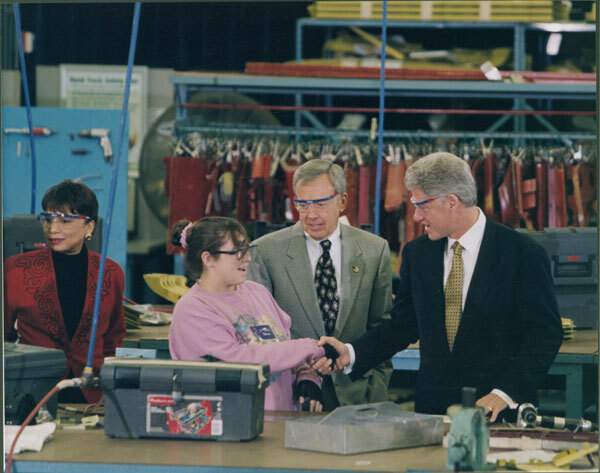 Description: United States President Bill Clinton toured Cessna's 21st Street training facility in Wichita on November 17, 1997. Alexis Herman, Secretary, Department of Labor; Russ Meyer, Cessna chairman; and President Clinton meet unidentified Cessna employee. Cessna's 21st Street Campus, 2220 East 21st Street North, was dedicated on the same day. President Clinton was the keynote speaker. Keywords: Wichita, aviation, business and industry, people. Description: View looking northeast toward Mid-Continent Airport. Southwestern Wichita has been site of airport since 1954. Commercial and charter aviation operations, delivery services, hotel and other businesses located along runways. Keywords: Wichita, aerials, aviation, buildings, airports.